Nestled at the foot of the rugged Sangre de Cristo Mountains in Santa Fe, the Inn and Spa at Loretto is a high-end hotel situated next to the historic Loretto Chapel that promises an unforgettable hotel experience. 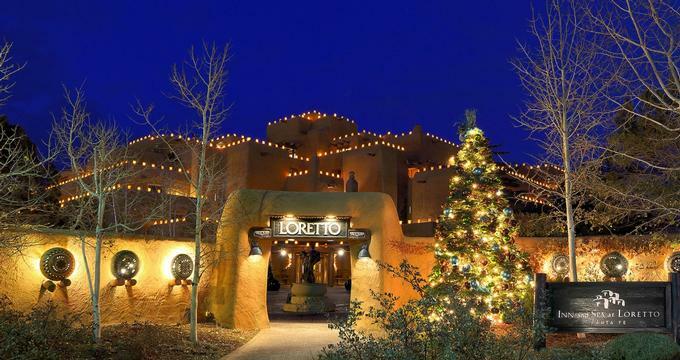 Just a few blocks from the Santa Fe Plaza, the Inn, and Spa at Loretto features well-appointed guest rooms and deluxe suites with dramatic Native American-style décor and comfortable furnishings, kiva fireplaces, and private balconies with glorious views. Boasting classic Taos Pueblo-inspired architecture, the charming hotel is home to a sophisticated restaurant that serves creative Southwestern cuisine, along with an in-house spa that offers pampering massages and body treatments using Native American traditions. There is also an outdoor swimming pool and a fully equipped fitness room and free parking for guests. Nestled at the base of the Sangre de Cristo Mountains in New Mexico's desert highlands, Santa Fe exudes an alluring blend of Anglo, Hispanic and Native American cultures and traditions, which are highlighted throughout the hotel. The Inn and Spa at Loretto feature well-appointed and comfortably decorated guest rooms in warm, earthy hues and vibrant colors with Native American-inspired furnishings, en-suite bathrooms with showers and baths, and modern amenities. In-room conveniences include flat-screen televisions with cable channels, clock radios and iPod docking stations, mini-fridges, coffeemakers, irons and ironing boards, hairdryers, telephones with free local calls, and complimentary wireless Internet access. Additional guest services include daily newspaper delivery, automated wake-up calls, and daily housekeeping services. Beautifully appointed Grande Guest Rooms feature Native American-inspired Southwestern décor and historical artworks, two double beds or one king-size bed in fine linens and hypoallergenic pillows, and en-suite bathrooms with walk-in showers, soaking tubs, plush towels, bathrobes, and slippers, and branded bath amenities. Stylish and sophisticated, Terraza Guest Rooms boast two double beds or one king-size bed in luxury linens and hypoallergenic pillows, and en-suite bathrooms with walk-in showers, soaking tubs, plush towels, bathrobes and slippers, and branded bath amenities. These rooms have direct access to a shared or private balconies with stunning views. Vista King Guest Rooms feature four-poster king-size beds in luxury linens and hypoallergenic pillows, and en-suite bathrooms with walk-in showers, soaking tubs, plush towels, bathrobes and slippers, and branded bath amenities. Sitting areas have vibrant Southwestern décor and enjoy spacious private or shared balconies with picturesque views of the surrounding mountains or the bustling city of Santa Fe. Vista Grande Suites feature all the comforts of the Vista King Guest Rooms with the added luxury of even more space and privacy. These romantic Santa Fe hotel suites feature cozy sitting areas with comfortable seating, four-poster king-size beds in fine linens, and en-suite bathrooms with walk-in showers, soaking tubs, plush towels, bathrobes and slippers, and branded bath amenities. Spacious private or shared balconies offer panoramic views of the surrounding mountains or Santa Fe. One and Two Bedroom Suites offer additional space for families or friends traveling together and offer open-plan living rooms with sofas and armchairs, and large windows overlooking the mountains. Separate bedrooms have king-size beds with fine linens, and en-suite bathrooms with walk-in showers, soaking tubs, plush towels, bathrobes, and slippers, and branded bath amenities. Spacious private or shared balconies offer panoramic views of the surrounding mountains or the city. The luxurious Penthouse Suite features five terraces with panoramic views, a fully equipped gourmet kitchen with state-of-the-art appliances and amenities, an elegant living room with a wood-burning kiva fireplace, and a formal dining area with seating for eight. The suite has a beautifully-appointed master bedroom with a king-size bed in fine linens, and an en-suite bathroom with a walk-in shower, soaking tub, plush towels, bathrobes and slippers, and branded bath amenities. The Penthouse also features a fully stocked library, a sunroom with an artist’s studio, and a dramatic spiral staircase to a terrace with unparalleled 360-degree views. The Inn and Spa at Loretto offer award-winning dining at two restaurants and lounges and vibrant night time entertainment at the Inn’s exclusive nightclub, Casa Espana. Luminaria Restaurant and Patio serves a globally inspired menu of inventive Southwestern fare served in a tranquil, inviting setting. Luminaria is open for breakfast, lunch, brunch, and dinner, and pairs the innovative menu with an extensive list of local and international wines and signature libations. The Living Room Lounge boasts a warm and sociable atmosphere in which fabulous cuisine, fantastic wines, and signature custom-crafted cocktails are served. The elegant lounge features plush leather sofas, comfortable chairs, and a warm, crackling wood-burning fire, along with a nightly happy hour and live entertainment every Thursday through Saturday evenings. Upscale amenities and guest services at The Inn and Spa at Loretto range from fine dining and libations at the Luminaria Restaurant and Patio and the Living Room Lounge, full concierge services and complimentary wireless Internet throughout the property to a heated outdoor swimming pool, a 24-hour fitness center, and a 24-hour business center. The hotel has a full-service spa, which offers a variety of treatments and services, including soaking tubs, couples treatment rooms, zero-gravity recliner chairs, and a Vichy shower. The hotel offers in-room spa services, valet parking, complimentary walking weekend tours of downtown Santa Fe, luggage assistance, a secluded garden with outdoor firepit, and a Tesla charging station. Laundry and dry cleaning services are available on weekdays, and the Inn is home to specialty shops and art galleries that sell Native American-inspired arts and artifacts. The Inn and Spa at Loretto provides a selection of beautiful indoor and outdoor venues for special celebrations such as weddings, ceremonies, and receptions, as well as corporate meetings and business gatherings. The historic Gothic-style Loretto Chapel features high vaulted ceilings, an elaborate Italian altar, and 150-year-old stained glass windows and is the perfect place for intimate ceremonies. The Inn also offers state-of-the-art audiovisual equipment and premium services such catering, music and entertainment, floral arrangements, décor and cakes and more. A professional event planning and management team is available to ensure the function or event runs smoothly.